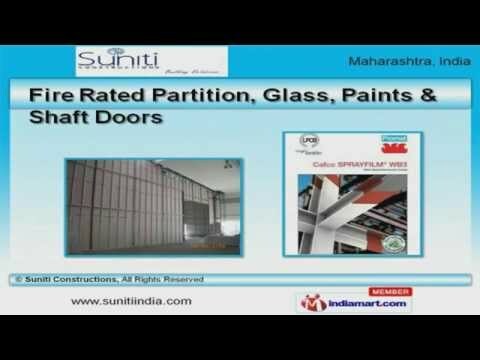 Welcome to Suniti Constructions, Manufacturer and Exporter of Fire Rated Door and Partition. The company was established in 2011 at Pune. Our State-of-the-art infrastructure and vast distribution network help us to cater Indian Subcontinent. Lupin, Sungard and Amanora are some of our esteemed clients and we are backed by large production capacity and industry leading prices. We offer a wide assortment of Fire Rated Partition, Glass, Paints and Shaft Doors. Our Wooden Fire Rated Doors and Fire Stopping are widely acclaimed in the market. We offer Fire Rated Partition, Glass, Paints and Shaft Doors that are acknowledged for their functionality. Access Panel and Fire Rated Doors for Construction Industry offered by us are one of the best in the market. Along with that we offer Industrial Steel Staircase and Fire Rated Partition for Office that are cost effective. Our Intumescent Strips and Access Panel for Commercial Industry are a class apart.